The purpose of this experiment was to compare the similarity of fingerprints between siblings and non-siblings. I became interested in this idea when I was looking at my sister’s and my fingerprints last year and I noticed how they looked a little bit alike. The information gained from this experiment could help police to determine criminal’s fingerprints by looking at some of their family member’s. If my hypothesis is correct it could also help orphans find their biological parents. My hypothesis was that siblings would have a higher percentage of similar type fingerprints than people who are unrelated. The manipulated variable was the hereditary relationship of the subjects. The responding variable was the similarity of the fingerprints. To measure the responding variable, I classified the fingerprints and compared the similarity for people who are biologically related to those who are not. 1. Get a fingerprinting kit. b) Non-related people must be expanded past cousins in a family. a) Spread ink on the pad. b) Spread thinly with brayer. e) Repeat with all fingers on both hands. f) Label all with this subject’s code. 4. Study fingerprint samples for one individual. a) Classify the prints as loop, whorl, arch, or abstract. b) Record data for this individual. 6. 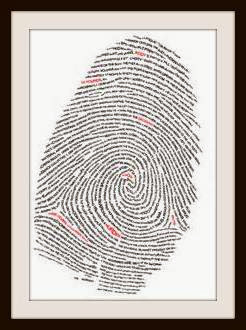 Determine the percentage of fingerprints that are alike within each sibling group. 8. Write down the conclusion. 9. Repeat steps a-e until all sibling groups are completed. a) Separate the fingerprints from their matches. c) Classify the prints as loop, whorl, arch, or abstract. d) Determine the percentage of fingerprints that are alike in that group. h) Repeat steps a-f until all non-related groups are complete. The original purpose of this experiment was to study the effect of similarity of fingerprints in a family. The results of the experiment were that the siblings had a higher percent of fingerprint similarity than of those who were unrelated. My hypothesis was that siblings would have a higher percentage of similar type of fingerprints than people who are unrelated. The results indicate that this hypothesis should be accepted, because they show that the groups of siblings had a higher similarity rate than those of the people who were not related. After thinking about the results of this experiment, I wonder if parents share the same type of fingerprints as their children. If I were to conduct this project again, I would have taken more fingerprint samples. Also, I would have made more trials for the experiment.